Monthly mean equatorial zonal winds in the stratosphere as a function of time and height. Eastward winds are shaded. 10m/s contour interval. This figure is updated monthly here, thanks to Marcus Kunze. (Original version created by Christian Marquardt (Marquardt, C. (1998): Die tropische QBO und dynamische Prozesse in der Stratosphäre. PhD Thesis, Met. Abh. FU-Berlin, Serie A, Band 9/Heft 4, Verlag Dietrich Reimer Berlin, 260 S.) I have highlighted the last two years. The quasi-biennial oscillation (QBO) in the equatorial stratosphere is one of the more remarkable phenomena in our atmosphere. In a region of about 15 degrees north and south of the equator, the east-west winds change directions, from about 20 m/s eastward to 30m/s westward and back again with roughly a 27 month period. As seen in the height/time plot shown above, these alternating winds first appear with a given sign at upper levels and then descend more or less regularly before stalling and decaying near the tropopause. There is generally one eastward wind layer and one westward layer at any given time: a new layer of eastward winds appears at upper levels once the previous eastward layer near the tropopause has been squeezed away by descending westward winds. Baldwin et al. 2001 is a classic review of both observational and theoretical aspects of the QBO. 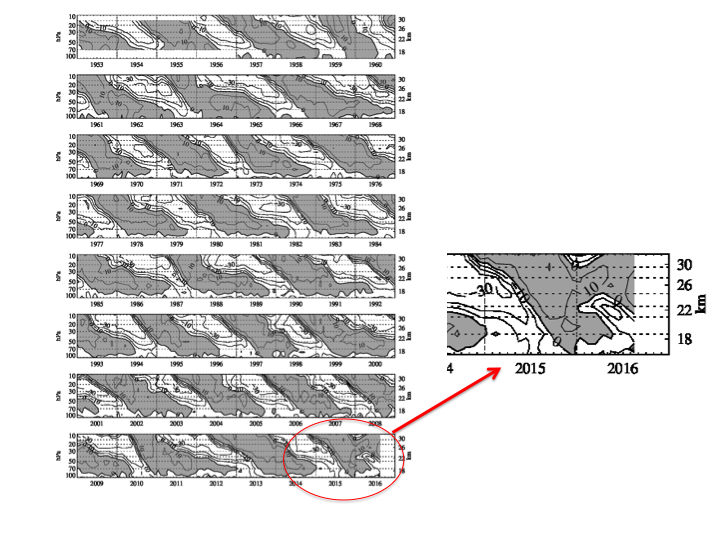 In its most recent evolution, the QBO has exhibited some strange behavior, as seen in the plot shown above — in the past year westward winds unexpectedly appeared at about 40 mb, interrupting the eastward winds in their familiar steady descent. This unusual behavior, evidently with no good analog over the period of our observations of the QBO, is discussed in two recent papers: Newman et al 2016 and Osprey et al 2016. The radative forcing (left) and global mean temperature response (right) using a simple GCM emulator, for the historical CO2 forcing (red) and for the linearly increasing forcing consistent with the simulations used to define the transient climate response (blue), for 3 different ramp-up time scales, the 70 year time scale (solid blue) corresponding to the standard definition. The average around the equator of the eastward wind in the upper tropospheric layer of the idealized atmospheric model of Suarez and Duffy 1992, for several different values of the strength of an imposed tropical heat source. GCMs often play a conservative role as a counterpoint to speculation or idealized modeling regarding “tipping points” or abrupt climate change, in favor of gradual, more linear climate response to external forcing. Think of abrupt collapse of the AMOC (Atlantic Overturning Circulation) or the “death spiral” of Arctic sea ice. These high-end models may not always be correct of course, but I think they provide an appropriate null hypothesis that must be critically examined in the light of observational constraints, possible missing physics, etc. I’ll use the problem of equatorial superrotation to illustrate this point — also taking this opportunity to introduce this relatively obscure subject. 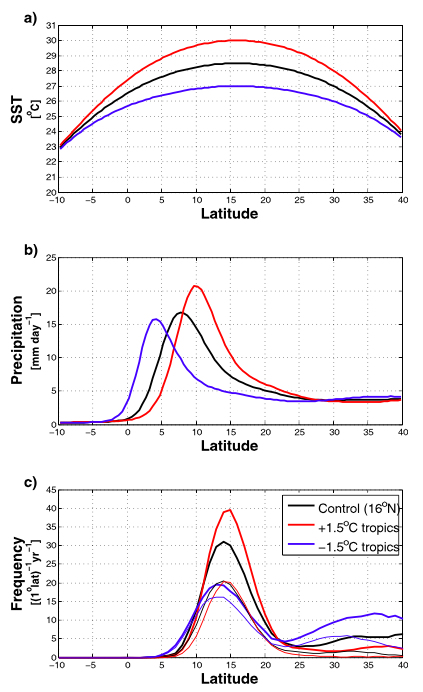 Ttropical cyclone statistics in the global aquaplanet model of Ballinger et al 2015 varying the strength of the surface temperature gradient in the tropics. 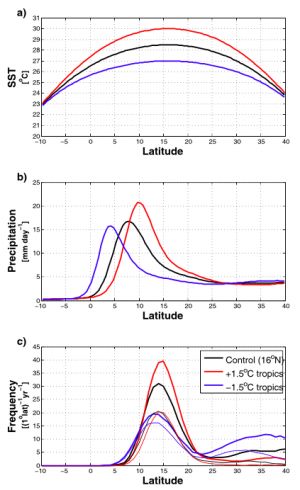 a) sea surface temperatures; b) precipitation; c) heavy lines: frequency of formation of tropical cyclones; light lines: frequency of formation of tropical cyclones that reach hurricane strength. A measure of cloud feedback (vertical axis) plotted against a property of the sub-grid closure for moist convection (horizontal axis) for 3 comprehensive atmospheric models developed at GFDL (red dots) and 3 versions of a prototype of a new atmospheric model, the 3 versions differing only in the treatment of “microphysics” within the sub-grid convective closure (blue triangles). Redrawn from Zhao et al 2016. 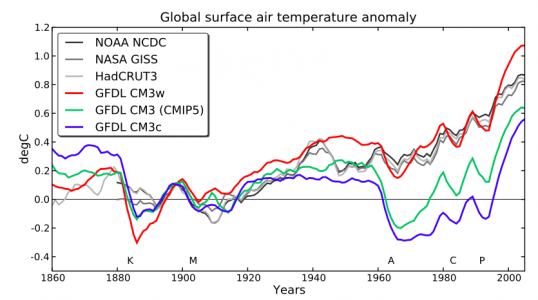 The current generation of global atmospheric models in use for climate studies around the world do some things remarkably well, as I’ve tried to argue in several earlier posts. But it is well known that they struggle with a part of the system that is critical for climate sensitivity: simulating the Earth’s cloud cover and how it responds to warming. They also struggle with simulating those aspects of the tropical climate that are sensitive to the moist convection that occurs on small horizontal scales — the effects of this small-scale convection need to be incorporated into climate models with uncertain “sub-grid closures”. Unfortunately, the treatment of moist convection affects cloud feedbacks. A key problem in atmospheric modeling is the large separation in horizontal scales between the circulations that contain the bulk of the kinetic energy and dominate the horizontal transport of heat, momentum, and moisture, and the much smaller convective eddies that provide much of the vertical transport, especially in the tropics. We talk about the aspect ratio of a flow, the ratio of its characteristic vertical scale to its horizontal scale. The large-scale eddies dominating the horizontal transport have very small aspect ratios. These eddies (extratropical storms and even tropical cyclones) are effectively pancakes. In contrast, the small-scale convective motions have aspect ratios of order one. You have to get the horizontal grid size down well below the vertical scale of the atmosphere — the tropopause height or the scale height — to begin to resolve these small-scale motions. They are not resolved in current global climate models, a fact that colors all of climate modeling. We try to develop theories (closure schemes) for the vertical fluxes by unresolved eddies, but that’s hard and success is limited. So groups around the world are developing global models with horizontal resolution of a few kilometers. (The animation in post #19 is produced by a model of this resolution but in a very small domain a few hundred kilometers on a side.) While these high resolution models don’t resolve all of the vertical transports, global models with horizontal grid size of 1km or so will clearly help a lot. But we are still pretty far from being able to utilize global models with such high resolution as a flexible tool in climate research. They are too slow on available computing resources. So we look for shortcuts. The strength of the Atlantic Meridional Overturning Circulation (AMOC) at 26N , in units of Sverdrups (106 m3/s), plotted against the ratio of the Transient Climate Response to the Equilibrium Climate Sensitivity (TCR/ECS) in a set of coupled atmosphere-ocean climate models developed at GFDL over the past 15 years. Redrawn from Winton et al 2014. 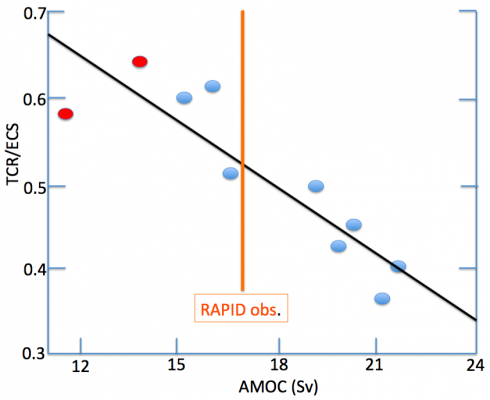 Also shown is the strength of the AMOC as observed by the RAPID array at 26N, from McCarthy et al 2015. An important piece of information about the climate’s response to CO2 (and the other long-lived greenhouse gases) is the degree to which the forced response manages to equilibrate to the CO2 concentration as it increases. Estimates of the degree of disequilibrium affect the attribution of the warming to date as well our ability to anticipate the longer term response to the anthropogenic CO2 pulse. Most of the oceanic heat uptake that determines the degree of disequilibirum occurs either in the Southern Ocean or in the Atlantic Ocean where it is associated with an overturning circulation consisting of less dense waters moving northward near the surface throughout the Atlantic with sinking in the subpolar North Atlantic and a return flow of denser water at depth. I’m focusing here on the latter, the Atlantic Meridional Overturning Circulation, or AMOC. 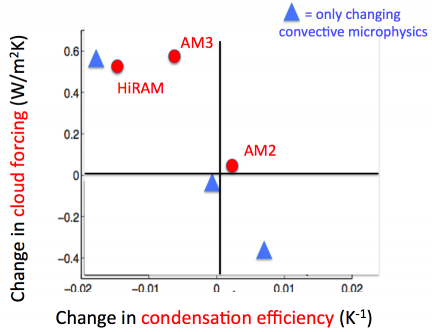 The case for the strength of the AMOC playing an important role in setting the rate of heat uptake by the oceans and the degree of disequilibrium in global mean surface temperature is made in particular by Winton et al 2014 and Kostov et al 2013, who describe two rather different perspectives on why you should expect a relationship between these two quantities.